Udupi, March 21, 2016 : Sudents of Dr. G. Shankar Government First Grade College collected at least Rs. 7.07 lakh through public donations for the treatment of their 19-year-old college mate Geeta who is suffering from sickle-cell anaemia. The total collected could me at least Rs. 10 lakh, including Rs. 7.07 lakh collected by college students, Rs. 1 lakh from Dr. G. Shankar Family Trust, Rs. 36,000 from LIC of India, and Rs. 1.76 lakh credited by donors directly into Geeta’s bank account. Geeta, is a first year B.Com student, on March 9 a a public appeal for donations for advanced treatment of her health condition was made. It was then that her college mates decided to go on a house-to-house campaign in entire city and raise money through donations. Geeta got 85 per cent marks in II PU and 72 per cent marks in first semester exam of first B.Com. She comes from a poor family. Her mother, Sheela, works as a domestic help and is the only earning member of the family for the last 12 years. Geeta is her only child. Her father, who went to some other place for work when Geeta was young, never returned. The mother Sheela now suffers from hypertension and age-related problems. Geeta is receiving treatment at Dr. T.M.A. Pai Hospital here. Sheela was spending Rs. 5,000 a month for her treatment. But doctors had advised her to get advanced treatment of bone marrow transplantation at Christian Medical College, Vellore. The treatment will cost Rs. 15 lakh. 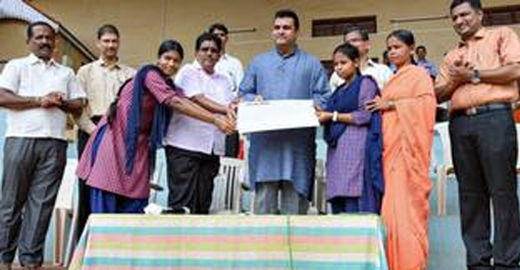 At a function held at the District Stadium here on Saturday, Pramod Madhwaraj, MLA, handed over the amount collected through donations to Geeta. College union leader Bhavya, who played a vital role in collecting the donation, was also felicitated on the occasion. MLA Madhwaraj said that the students of the college besides pursuing academic education had taken up a humanitarian cause and had become models for the society. “I will try to get the maximum possible help from the Chief Minister’s Relief Fund,” he said. G. Shankar, patron of the college, said that his trust was ready to pay what was possible additionally if it was needed for Geeta’s treatment. Motehr Sheela became emotional at the function and was seen wiping her tears. Vishu Shetty Ambalpady, social worker, Jagadish Rao, college principal, Roshan Kumar Shetty, college physical director, were present. For those interested in donating, Geeta’s account number is: 01102210093646 (IFSC code: SYNB 0000110), Syndicate Bank, Catholic Centre branch, Udupi. Hats off to all the donors. Humanity is the best policy.